‟The idea of a world without work has returned. Mainstream economists "preach the virtues of work" and across the world "the capitalist work ethic prevails". However, "the world of work, already satirized by LaFargue and others in the nineteenth century, clearly no longer works", David Ruccio argues. Dr. David F. Ruccio is a renowned marxian economist, professor of economics at the University of Notre Dame, where he has taught since 1982. He is also a member of the Higgins Labor Studies Program and the Joan B. Kroc Institute for International Peace Studies. He blogs, tweets, and contributes to the journal Rethinking Marxism (which he edited for twelve years), Real World Economics Review and Democracy at Work. Originally published on Ruccio's personal blog (Jan. 24, 2018). S tudents are much too busy to think these days. So, when a junior comes to talk with me about the possibility of my directing their senior thesis, I ask them about their topic — and then their schedule. I explain to them that, if they really want to do a good project, they’re going to have to quit half the things they’re involved in. They look at me as if I’m crazy. “Really?! But I’ve signed up for all these interesting clubs and volunteer projects and intramural sports and. . .” I then patiently explain that, to have the real learning experience of a semester or year of independent study, they need time, a surplus of time. They need to have the extra time in their lives to get lost in the library or to take a break with a friend, to read and to daydream. In other words, they need to have the right to be lazy. As it turns out, that’s exactly what Paul LaFargue argued, in a scathing attack on the capitalist work ethic, “The Right To Be Lazy,” back in 1883. ‟Capitalist ethics, a pitiful parody on Christian ethics, strikes with its anathema the flesh of the laborer; its ideal is to reduce the producer to the smallest number of needs, to suppress his joys and his passions and to condemn him to play the part of a machine turning out work without respite and without thanks. Today, nothing seems to have changed. 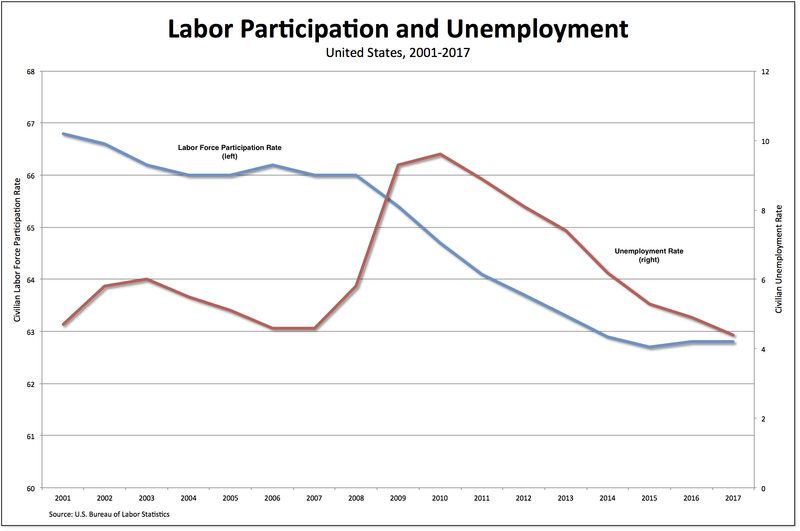 Workers (or at least those who claim to champion the cause of workers) demand high-paying jobs and full employment, while mainstream economists (from Casey Mulligan, John Taylor, and Greg Mankiw to Dani Rodrick and Brad DeLong) promote what they consider to be the dignity of work and worry that, even as the official unemployment rate has declined in recent years, the labor-force participation rate in the United States has fallen dramatically and remains much too low. Mainstream economists and their counterparts in the world of politics and policymaking — both liberals and conservatives — never cease to preach the virtues of work and in every domain, from minimum-wage legislation to economic growth, seek to promote more people getting more jobs to perform more work. This is particularly true in the United States and the United Kingdom, where the “work ethic” remains particularly strong. 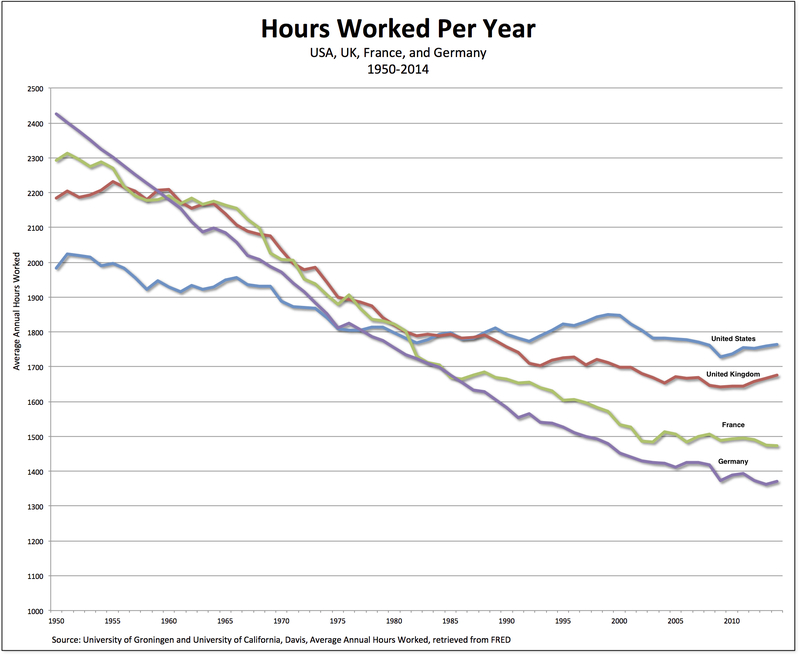 The number of hours worked per year has fallen in all advanced countries since the middle of the twentieth century but, as is clear from the chart above, in comparison with France and Germany, the average has declined by much less in America and Britain. 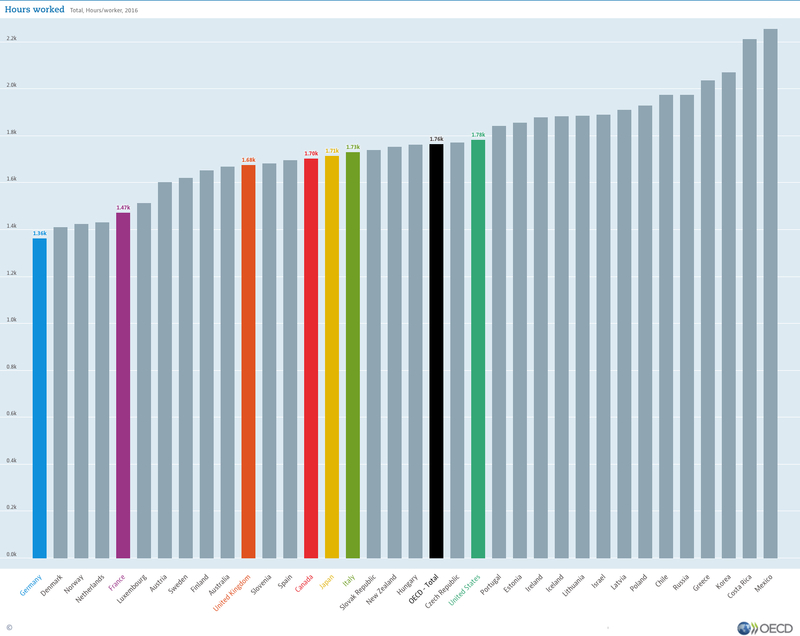 Today, according to the OECD, American and British workers spend much more time working per year (1765 and 1675 hours, respectively) than their French and German counterparts (1474 and 1371 hours, respectively). But in all four countries — and, really, across the entire world — the capitalist work ethic prevails. Workers are exhorted to search for or keep their jobs, even as wage increases fall far short of productivity growth, inequality (already obscene) continues to rise, new forms of automation threaten to displace or destroy a wage range of occupations, unions and other types of worker representation have been undermined, and digital work increasingly permeates workers’ leisure hours. ‟Post-work may be a rather grey and academic-sounding phrase, but it offers enormous, alluring promises: that life with much less work, or no work at all, would be calmer, more equal, more communal, more pleasurable, more thoughtful, more politically engaged, more fulfilled – in short, that much of human experience would be transformed. 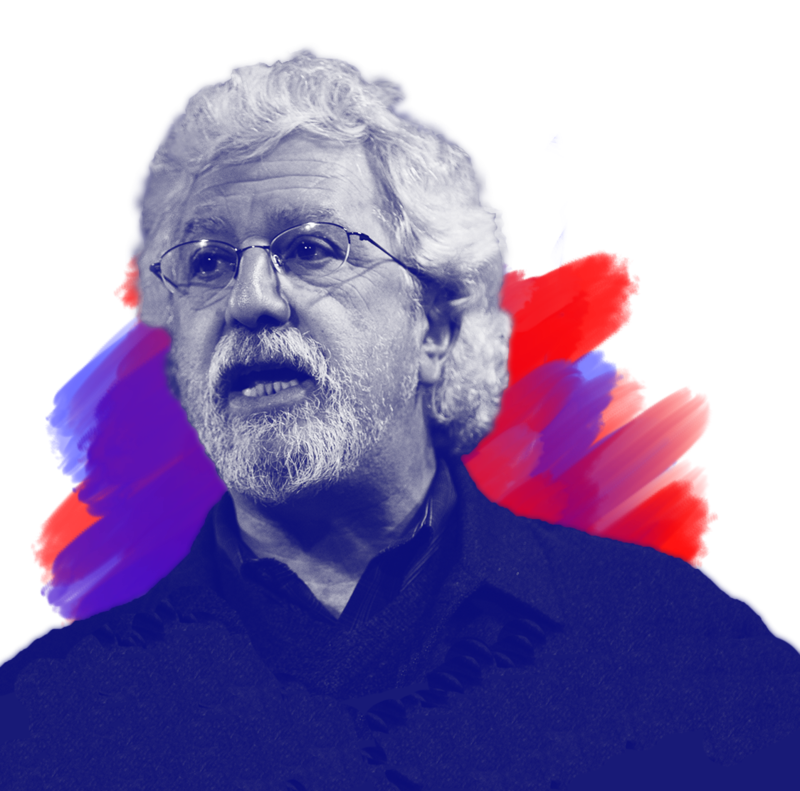 I’m willing to keep the utopian label for the post-work thinkers precisely because they criticize the world of work — as neither natural nor particularly old — and extend that critique to the dictatorial powers and assumptions of modern employers, thus opening a path to consider other ways of organizing the world of work. Most importantly, post-work thinking creates the possibility of criticizing the labor involved in exploitation and thus of creating the conditions whereby workers no longer need to succumb to or adhere to the distinction between necessary and surplus labor. ‟convince the proletariat that the ethics inoculated into it is wicked, that the unbridled work to which it has given itself up for the last hundred years is the most terrible scourge that has ever struck humanity, that work will become a mere condiment to the pleasures of idleness, a beneficial exercise to the human organism, a passion useful to the social organism only when wisely regulated and limited to a maximum of three hours a day; this is an arduous task beyond my strength. That’s the utopian impulse inherent in the right to be lazy.